On a lovely warm day I walked into the gardens of St Luke’s and drew a picture. The Baths have recently (c. 2013) been refurbished and now have swimming pools and a spa and gym. They are still owned and run by the local authority, Islington. The tall tower is the 42-storey Carrara Tower of the 250 City Road development, by Foster + Partners, under construction. The shorter tower at the back on the right is Canaletto, which must be one of the hardest towers in London to draw. Those weird curved structures defeat my sense of perspective. Perhaps that’s the idea. The building on the left of the picture is Burnhill House, run by Keniston Housing Association. 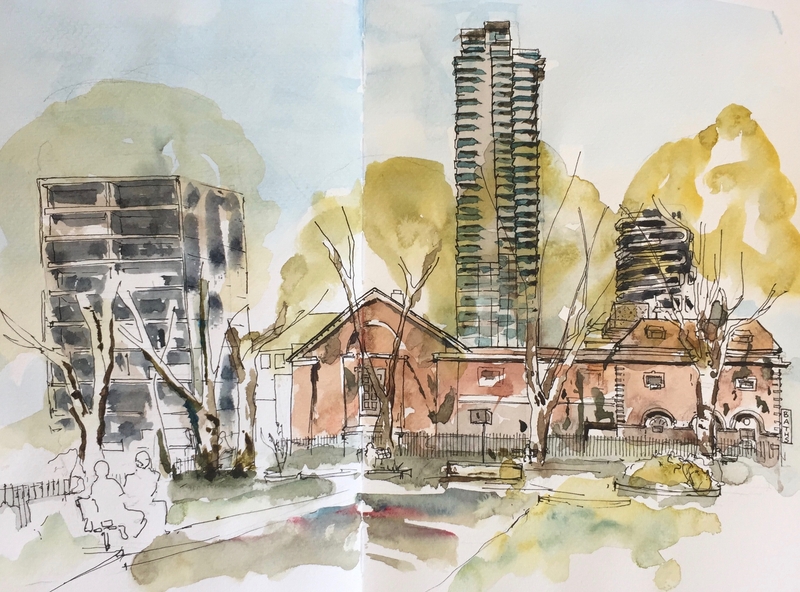 Residents here are running a campaign to try to moderate plans to redevelop Finsbury leisure centre, which is off to the left of my drawing, and in front their building. Their banners adorn their balconies. Protest banners at Burnhill House. From Camden new Journal, September 2017. In the centre front of the drawing is a strange cage-type object on a stalk. This is a bird-feeder, enclosed in a wire cube. It looks like a cage or house, or an artwork. Birds do go in there. I watched them. About one and a half hours, drawn and coloured on location. Double page spread in Jackson’s watercolour book.